Chief Planner at the Town and Country Planning Department, Mr. Gregory Adams said the project initially began in February 2017. He added that by the time the Territory was impacted by Hurricane Irma in September of that year, a substantial amount of work was completed including the inception report and the situation analysis based on the community’s feedback at the time. After careful planning and consultation the project has been approved to resume the work started. “This planning exercise titled ‘enVIsion 2040’ will guide the Territory’s rebuild and development over the next 20 years and reflect the holistic vision of the community in this process,” he said. The Chief Planner added that over the last few months, numerous meetings have been held with the Environmental Systems Limited consultants, officials from the Organisation of Eastern Caribbean States (OECS) and Government officials. Common themes included the preservation of natural and historical sites, proper infrastructural development, effective waste management solutions, improvement of banking services on the sister islands, population control, transportation, land development and sustainable land use, zoning, crown land, immigration, tourism development, protecting the natural environment, improving social development and strengthening the agricultural sector. Mr. Adams said the success of the project will continue to rely heavily on input from all sectors of the population and public engagement in the process will be critical. Residents on Tortola are therefore invited to attend the consultation at the Althea Scatliffe Primary School later today at 6:30 p.m. Consultations will also be held from November 5 through 8 on the Sister Islands. 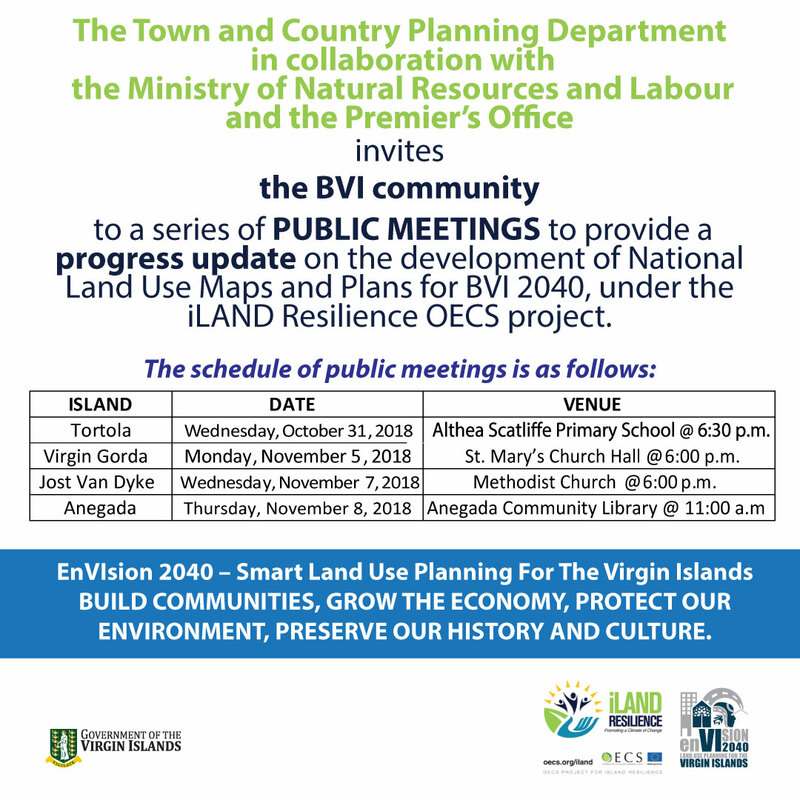 Meetings will be held on Monday, November 5 at St. Mary’s Church Hall at 6:00 p.m. on Virgin Gorda; Jost Van Dyke on Wednesday November 7, at the Methodist Church at 6:00 p.m. while residents of Anegada will meet on Thursday, November 8, at the Anegada Community Library at 11:00 a.m. The Town and Country Planning Department’s team will be presenting a Visioning Exercise which will involve transforming the proposed policies into a graphic representation using the various issues raised by the community to shape what the developmental policies could be, and the legal framework in which these policies are to operate. In addition, an environmental sensitivity activity will be conducted to identify natural habitats and the organisms living in them to ensure that they are not disturbed during any future developments. The enVIsion 2040 physical development project is part of the Territory’s National Physical Development Plan initiative spearheaded by the Government of the Virgin Islands, through the Town and Country Planning Department, in collaboration with the Ministry of Natural Resources and Labour and the Premier’s Office, with funding provided by the Organisation of Eastern Caribbean States (OECS) Global Climate Change Alliance. The enVIsion 2040 project is supported under the umbrella of the regional iLAND Resilience Project to promote climate change adaptation and sustainable land management which is funded by the European Union (EU) and administered by the Organisation of Eastern Caribbean States (OECS) Secretariat. The enVIsion 2040 project is led by the Town and Country Planning Department, in partnership with the Ministry of Natural Resources and Labour, with technical support provided by Environmental Systems Limited, in collaboration with Dillon Consulting and Acacia Consulting and Research.